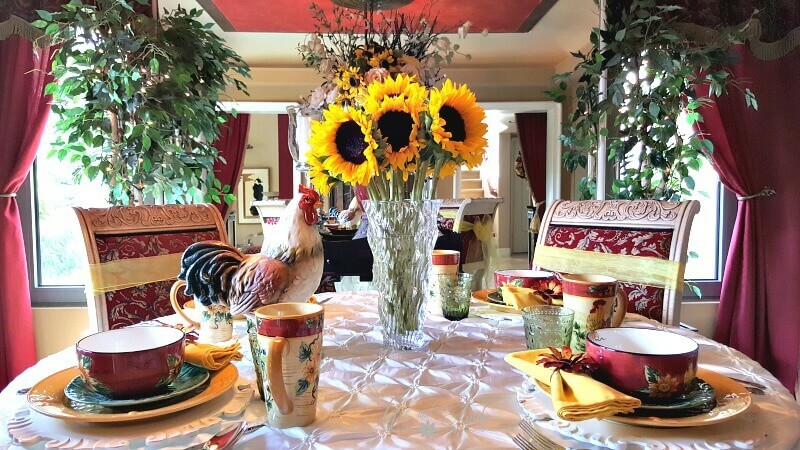 I am overdue for a post, so I am sharing my red breakfast room with sunflowers and roosters. The red bowls have a rooster and sunflowers on them. 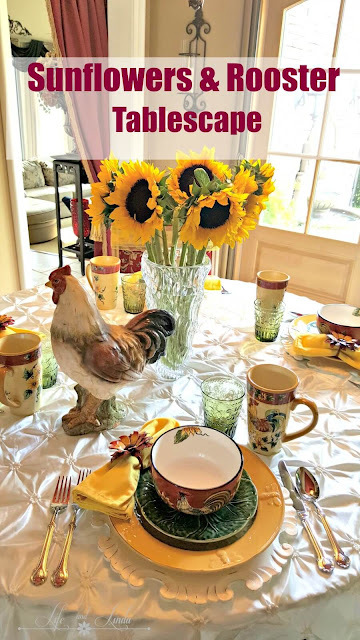 I talked to Liz, from Infuse With Liz this morning and found out she did a table with sunflowers and yellow plates too. Who doesn't love a bunch of fresh sunflowers? They brighten the day with their presence. 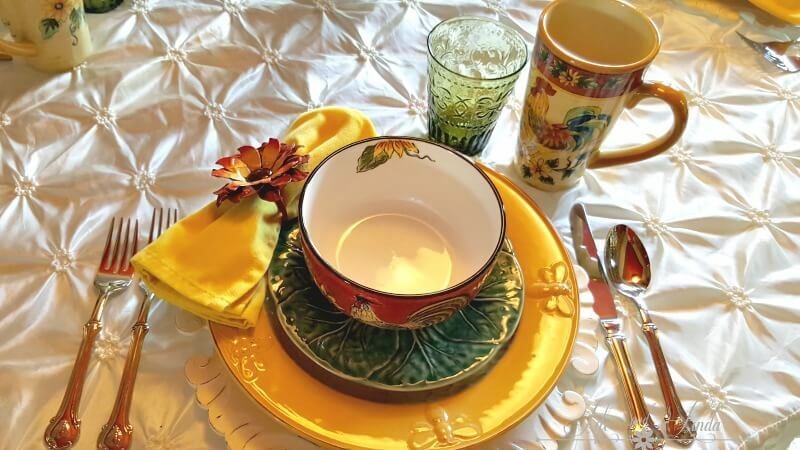 Green cabbage salad plates sit on top of my yellow bee plates with the white scalloped chargers from Pier1. 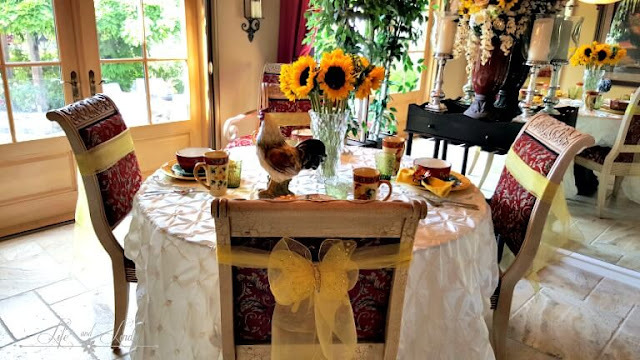 Yellow napkins compliment the yellow in the sunflowers with sunflower napkin rings. I tied yellow sashes on each red chair for added pop. Cute tall rooster mugs fit right in. The rooster is so cute! Notice the bee flatware? Green fleur de lis glasses compliment the green cabbage plates. 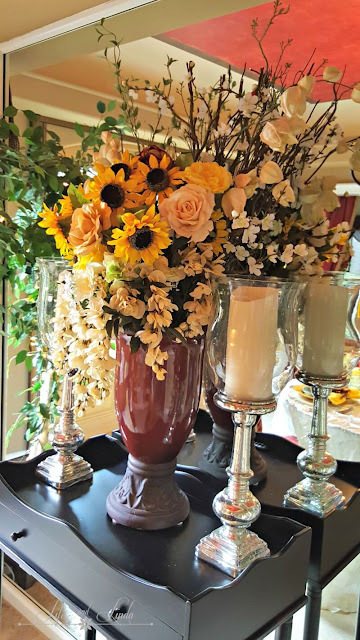 I dressed the tall vase on my serving cart, by adding sunflowers. I am still in love with my red ceiling in this room. years ago, I faux painted it. Monique, we have more wine.....LOL I hope your week is going great! As usual I have been tweaking some blogs. I love this! The rooster dishes look so cute with the golden yellow bee dishes. Good thing I didn't use those napkin rings because I have them too! I'd leave this table set up to enjoy for many days! I'm so happy the sunflowers are holding on so long. Those Pier 1 chargers are the best investment- I've used them a lot for many different themes. Mary did one with sunflowers too- so we're not alone! Hi Linda, I love this look with all my favs. Your bowls are darling and the layering is perfect. Love the rooster and the napkin rings are the perfect touch. You always style the best table settings. 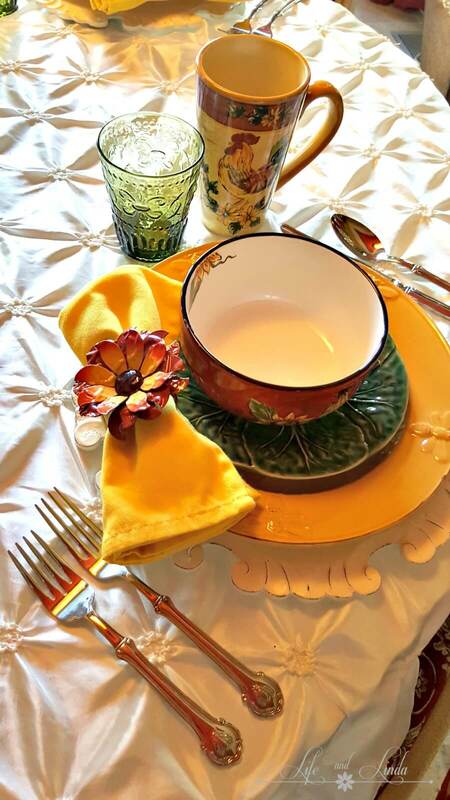 Linda, you do amazing tablescapes. Sunflowers are my favorite spring/summer flower. Thank you for your help with my blog Linda! And did you serve CHICKEN for lunch too? Debra, you are so funny. We actually had carrot soup. Is there any flower happier than a sunflower? I don't think so! They just make me smile. :-) I can't help myself. 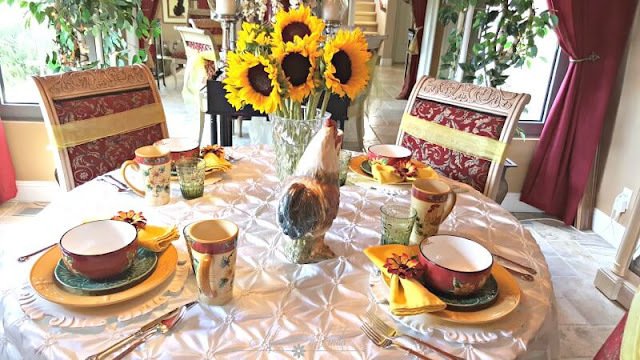 Linda, As always your home and design/tablescape looks like it came right out of a magazine. I am in awe of your talent! Your friends and family are so blessed by you! Linda, what a wonderful table! Lovely table Linda, and you're right. There is no flowerful that's happier. Hi Linda! I love your cheerful, colorful, happy table! The rooster bowls and mugs are perfect with your cute rooster and your lovely sunflowers. How pretty that you added sunflowers to your side table, too. Yes, I noticed the bee flatware, which I've always swooned over! Thanks for sharing your pretty breakfast room. Thank you Kitty, sunflowers are a happy flower. Maybe look for the Bee flatware when it is on sale at Horchow or? Monique, we only received part of the bed. They made a mistake about having the bed base in stock. We are supposed to receive three bases on Tuesday. They also gave our pillows to someone else by mistake and the people used them. So, we are also waiting for new pillows. Well, I have been visiting you several times this morning and each time I was getting ready to write you a note-something took be away from this computer! Love this combination and oh these sunflowers:) I have some sunflowers that I grew from tiny baby seeds and they grew up and are about ready to bloom! Always such a happy and graceful time spent here with you dear Linda! So pretty and you give us tons of inspiration! I simply love sunflowers and can't wait to get them at our farmer's market soon! This room is beautiful. I love the red ceiling! I have often decorated with cows and sunflowers. I love sunflowers! I think that the roosters are a great addition to this décor and I might try to add some to my kitchen soon. Hello Linda, I love sunflowers and the floral arrangement looks beautiful as does your table! This table setting looks "happy" to me! Sunflowers do that ~ :) Every detail is perfect, as usual. The bowls are adorable as well as the mugs. This is one of my favorite color combinations. It's so cheerful. Thank you so very much for joining Thoughts of Home on Thursday. Your post truly delighted me. 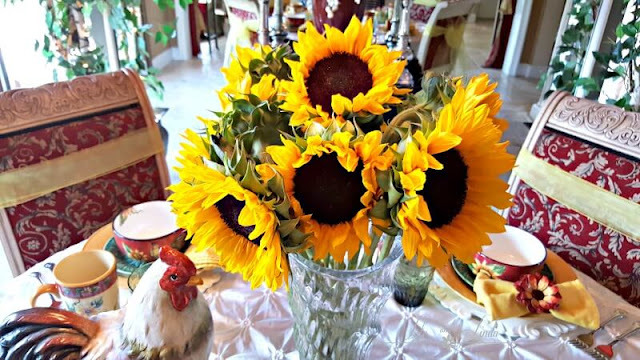 Roosters always make me smile, and yours pairs perfectly with that vase of happy sunflowers! What a way to start the day! My sister-in-law would love your table. She is a farmer/rancher with a herd of cattle. Her kitchen is filled with roosters. Red and yellow look so good as a country table. What a happy tablescape, Linda! I love those sunflowers inspiring all that loveliness! The room is so bathed in light - just brings a huge smile on my face. Thanks for your visit! Have a wonderful, happy and blessed week! Sunflowers exude happiness. Cheerful, happy, fun, delightful are words I think of viewing your tablescape.